We recently found out about a project to make custom printed tennis balls for an event in Sweden last year. But those words only fueled our creativity and made us move forward. 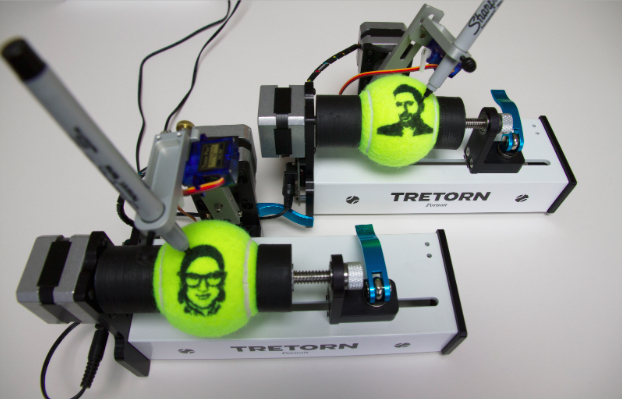 They 3D printed some custom couplers to hold the tennis balls and wrote some custom software to streamline the printing process, and then printed on hundreds of tennis balls. We’ve since updated the wiki. This entry was posted in Eggbot. Bookmark the Permalink. So I’m curious what the workflow was like – it looks in the video like all four EBs are driven in parallel. What new software did they create? What does it do? How ‘custom’ is each ball? I think they made it so that the folks at the print station could easily select a portrait and click print. They may have created some automated image processing to convert to vector output and optimize. The video implies it was set up with a photobooth, but it looks like most of the balls they showed were of tennis players. It would be nice if they could share the tools they used, I think my local YMCA would love to be able to do this for the kids or at fund raisers for the Tennis program. Spend $10 and get a ball with your face on it! Spend $20 and get a ball with someone else’s face to beat on! Spend $50 and get the YMCA director’s face on there! Yes Please share your code! The spirit of EggBot is Open! Hey, I was the technical director of this project and wrote all the software involved. – When all this is done, all the data is stored in a local database, and through a web app, the staff can select which portraits should be printed first (or which should be excluded). – A node.js application running in the background manages the state of the 4 printers and automatically starts a print as soon as there is a free printer. All that is done by issuing Python commands in the command line. Unfortunately I cannot share much code at this stage since this is a comercial project that is still actively being used by Tretorn (they are on tour with the booth on tennis events in Europe). Hi Paulo, It will be so cool! Look forward to your update! !